Certain life-events can call for a total re-imagination of your personal brand. Whether you are shifting career paths, running for public office, vying for a big promotion, or becoming a parent, you may want to reinvent your online presence. Every single piece of information that can be found about you on the internet comprises your online reputation. Whether you know it or not, this reputation affects your relationships, career, and daily life. Regardless of your reason for wanting a fresh start, with the right steps you can create a digital footprint that aligns with your goals. It’s time to take control of your new brand. As technical as it may sound, re-structuring your online presence doesn’t need to feel like a chore. The beauty of the internet is that an individual can design whatever personal image they want to create. There is endless room for creativity, and as long as you are authentic to yourself, it can be an enjoyable and rewarding process. You don’t necessarily need to have a “bad reputation” on the internet to want to reinvent yourself. Examining and rebuilding a digital footprint can be a reflective journey of self-exploration. Taking an honest look at the way people perceive you can be scary, but also enlightening. How do I know if I need to reinvent my online presence? Often, information that is misleading, inauthentic, or generally off-brand gets posted about people online. Just because this information exists doesn’t mean it represents the subject in a genuine way. If you Google your own name, and you don’t like what you find, you may need to reinvent your online presence. Old photos from college, press coverage about a previous career path, or opinionated political posts that no longer reflect your views could be standing in the way of your clear personal brand. By examining your digital footprint, you can determine whether your online presence needs refiguring. 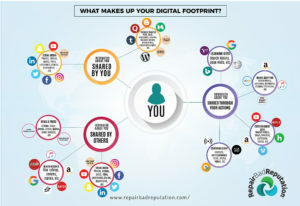 The Reputation Map – What Makes Up your Digital Footprint? How do you measure your online reputation? When you are examining your digital footprint, consider all of the information about you that is online. The internet is vast, and there is a lot of ground to cover. You may need to start from scratch and move through the map section by section. Take notes about which content bolsters your brand and highlights your strengths, and which content shines a negative light. Even though you are working on your individual digital footprint, brand building can be a collaborative process. Reach out to other people who are growing their presence as well. By working with others, you can utilize cross-promoting content. Look for influencers who are in the same niche as your brand. You may want to ask them to write a guest blog for your site or let you contribute information to theirs. Ask friends to share your new videos or articles on social media in return for sharing something they posted. The goal is to flood the internet with new, positive content – teamwork can make that process move much more quickly. Maintaining momentum in building your online presence can be challenging. Personal branding is a life-long endeavor. You must create new content consistently for a reputation to stand firm against further false information. Having a plan is vital. As you create your content strategy, don’t forget about your core message. The values you built your personal brand on should remain apparent in your content as time progresses. You can’t maintain a strong personal brand without authenticity.